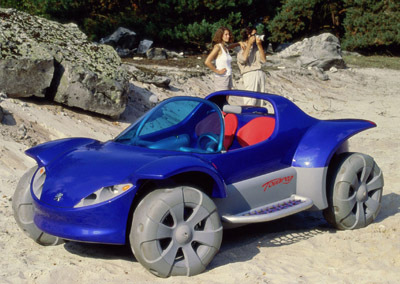 The Peugeot Touareg was a far-out proposal for an electric powered 4x4. The 859 kg (1874 lb) Touareg concept was motivated by a mid-mounted 1855 volt electric motor which developed 144 ft-lbs of torque at 1500 rpm. This unit gave the concept a 70 mph top speed and 300 km range. 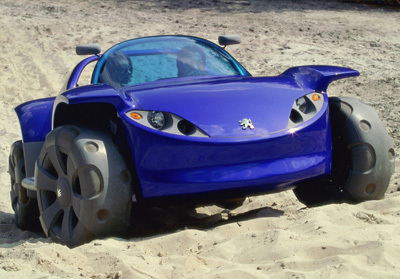 The bulbous moon-buggy styling of the Peugeot Touareg was enhanced by the use of innovative 18" wheels which seemed to meld the wheel into the tire. The two-seat passenger compartment of the concept is housed in a carbon frame, the body is formed from moulded plastic.